I have been obsessed with oversized paper flowers for a few years now. 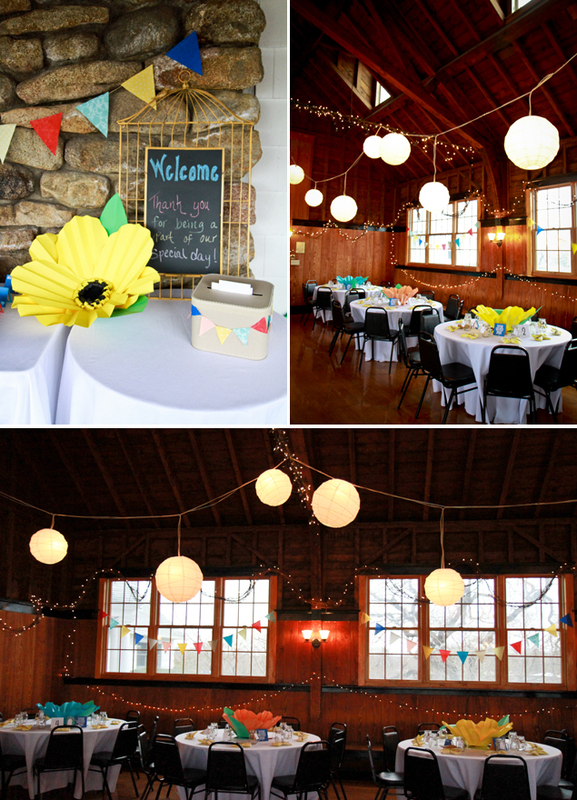 Ever since I saw the big DIY paper flowers that Brittany from The House That Lars Built created for her wedding (way back when), I knew I wanted to use them in my own wedding celebration someday! So when the time came to start planning my own wedding projects, I knew right where to go for the centerpieces. Just like the Giant Crepe Paper Roses I made as bouquet alternatives, these giant blooms are huge statement pieces that are affordable on a small budget and fun to make! 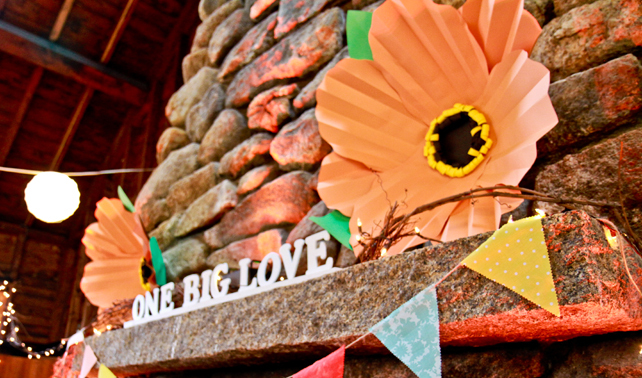 You can find step by step instructions in Brittany’s Giant Paper Flower Tutorial on her blog. Below are some of my own DIY tips for this project. Tip #1:� Do a trial flower(s). I found it helpful to create a couple trial flowers in different sizes to figure out what size would be the best fit. Tip #2: Use a bone folder! One of my crafty bridesmaids recommended this to me and it made a huge difference. When it came to doing the accordion folds for texture in the petals, I found that it was much easier to use a bone folder to make the creases. Without using one, my folds were not precise and the paper cracked. By doing a quick score and fold using this tool, the folds were crisp and clean and also held better than just folding by hand. Tip #3: Do each step for all flowers at once. I made about 30 of these big and beautiful flowers. Instead of following the step by step tutorial through to the end for each flower, I decided to break it down piece by piece. For example… first I traced all of the petal and leave shapes, then cut out all of the shapes I had traced, then folded all of the petals.. and so on. In the end I had huge piles of each of the flower pieces and could simply grab from the pile to put together the final finished flower. Tip #4: Dedicate a storage space! 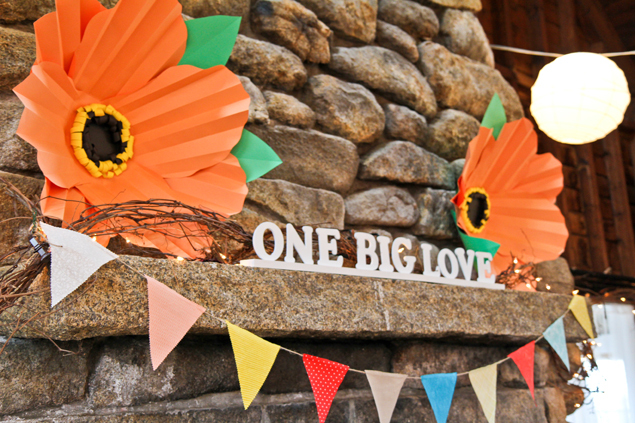 If you are making a bunch of these flowers… make sure you have the room to store them until your wedding day. These huge blooms take up a LOT of space! I had to dedicate an entire room just to storing all of the DIY flowers for my wedding day. Tip #5: Give yourself enough time! Like all DIY projects, paper flowers take time… and these beautiful blooms take quite a bit of it. After you create your trial flower(s) you’ll have a good idea of the amount of work and time it takes to have one finished flower. Once you know that, plan out how much time it will take (and decide how much time you’re willing to put in) to create all of the flowers needed for your event. 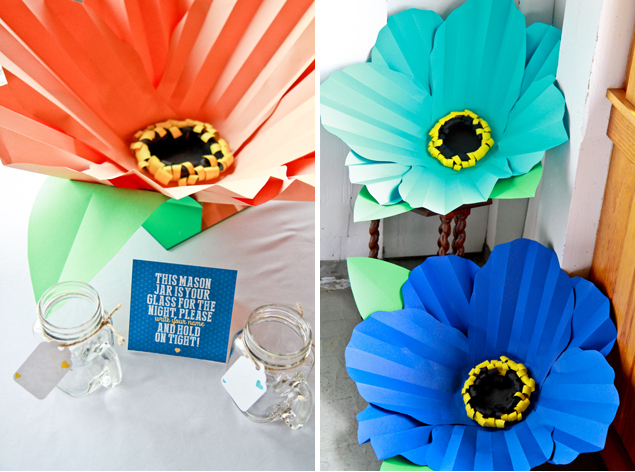 Find the tutorial for making these huge paper flowers HERE.